"Yo! Me I know dancehall be my thing, so if anyone try me, i go diss am ... bush boys" was Shatta Wale's introduction on his new song. 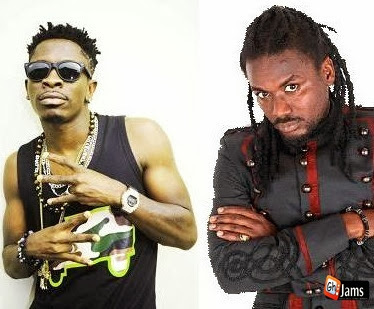 the Guinness Big Eruption Show slated for November 23 at the Accra Sports Stadium, self acclaimed 'Dancehall King', Shatta Wale has shocked Ghanaian music fans as he takes Samini to the cleaners with a new diss song. Unlike previous dissing songs that Shatta Wale has released, he was emphatic, personal and nasty on this new single titled "Letter 666 to Samini". The song has come out at a time that, most music fans thought that the bad blood flowing between them had ceased but clearly with the release of the song; means there is more to it than we are assuming. He ended the song with "That's why I f**k your girl. Fool." Check the song out!! !